• Crash diet triggers water loss and loss of muscle mass. A slight loss of water in the body slows down your metabolism. When your diet fails, you regain the lost fat instead of regaining muscle mass and reach a plateau which is a task in itself to break free from. Read here to know more about the much dreaded "weight loss plateau". • Even the worst diet in terms of nutrients, will cause weight loss initially, not because of any magical food or technique, but because you eat fewer calories than you burn. Restrictive diets also restrict carbs as they are considered to be fattening. But on the upside carbs are necessary because they fuel your body and brain. So a no-carb or low-carb diet does not just bring down your energy level, it also lowers your cognitive skills. • A GM diet with just fruits may work initially and help in weight loss, but for how long can you survive only on fruits? Any diet that will keep you away from your favorite food will lead you back to your former eating behavior, increasing your craving, and eventually your weight. • Depriving your body of food slows down your metabolism. Energy required for your body's core functioning is obtained from energy conserves derived and not from the food you eat. • Your metabolism doesn't readjust itself when you restart your old diet regimen after a crash diet or a detox diet and will therefore cause your body to start storing the extra calories you are consuming, leading to weight gain. Research suggests that the body is well equipped with organs like the liver, kidney and overall the immune system to help cleanse and detoxify itself. So, there is no need to put our body through a rigorous detox routine. 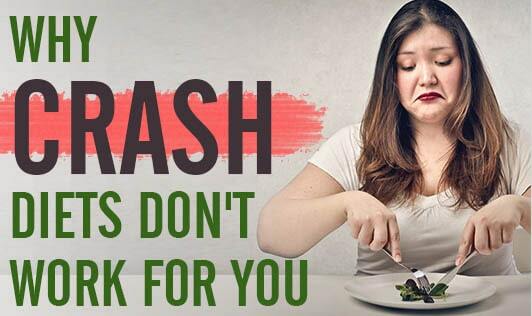 • Crash diets are known to restrict fat so that it reduces cholesterol in the body. But on the contrary, you can expect a hike in your cholesterol levels after a crash diet session as your body will start compensating for the no-cholesterol diet by producing more cholesterol in the liver to assist in the functioning of your body. • Severe restrictive diets are also known to cause depression, anxiety, irritability, anger, mood swings, and a preoccupation for food. So, to begin with, get the term "diet" right. It is not about fasting, skipping meals, or eating only one kind of food or restricting all those foods that you like. It is all about eating mindfully and in moderation. Dieting is also about finding out strategies to satisfy your hunger with fewer calories and most importantly, sticking to your goal. Set realistic short goals to keep your determination high. Play it safe with a healthy, balanced diet. Consult your dietitian now for a sensible diet plan.